grayDUCK Galley is excited to announce the grand opening of our new East Austin location. 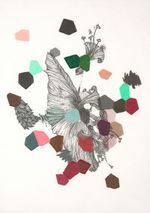 It’s been a long time coming and we are thrilled to showcase work from the San Antonio artist Leigh Anne Lester. 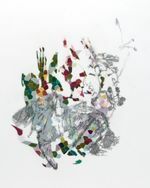 Her intricately detailed representations of an amalgamation of plant species, inspired by genetic modification, evoke thoughts on the environment and the effects we humans may be creating. Lester’s mutant species are created in layered drawings and wall installation cutouts. My work addresses the place between the genesis of genetic modification and its possible aftereffects. Genetic modification offers humans the resources and means to change the composition of species from the microscopic level to the macroscopic system; to change the composition of a species by deleting or adding an attribute to suit our own desires. But, what is disposable? Too often we don’t have a clear view of what the ramifications will be for a plant that has been altered or the species that depend upon it for survival. The new outcome of this potentiality can capsize a natural balance or create a new species for that balance. This possibility is as exciting as it is frightening. There is beauty in the unknown. Beauty is an important tool in my work to lure and entice the viewer. Through the natural appeal of the plants, the graceful line of the drawings, the luminosity of the vinyl, the luxurious surface of the silk embroidery, the viewer is asked to consider the paradox that beauty is really a balance of order/control with abandon/uncertainty. 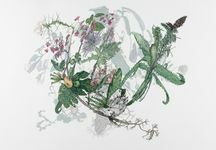 In my drawings, I utilize historical botanicals on layers of semi-transparent drafting film with a botanical drawn on each layer. The transparency of the drafting film allows the line of each image to optically blend with the next layer, generating a flux between the different components of each of the individual plants. 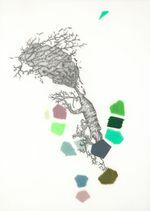 Elements of each of the species mix and tangle their visual attributes intermingling disparate species of flora much like a palimpsest with divergent layers and characteristics perceptible beneath the surface. 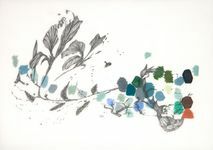 I am currently sourcing from these drawings, seeing them as parent plants that create future generations. The genesis plants are put through a program that distills the imagery into color cells that vaguely reference the former plant images. 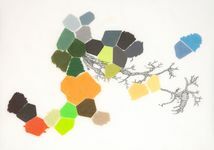 These floating cells are then intermingled visually with a graphite drawing of a separate distorted color drained offspring plant, implying a cellular, morphological struggle for resolution. With this new “Frankenstein“ flora I bring into play a sense of the possible, whether good or bad. I want viewers to think of it as a premonition of the consequences of genetic modification.